Every once in a while comes a player that makes poker history. There has been a number of these, from Stu Ungar, Doyle Bruson and Johny Chan to Phil Hellmuth and Chip Reese. All of these left a lasting marking in the world of poker. They all imposed their personal styles to the game, won the biggest tournaments for millions and became household names. Today, when we speak about poker stars, three names come to mind : Phil Ivey, Doyle Brunson, and Kid Poker : Daniel Negranu. So just how did Daniel Negranu go from being a broke high school student in Canada to a multi-millionaire poker superstar, a lead instructor for online poker training site poker vt and even the main character in an Xbox game stacked. Daniel Negranu was brought up in Toronto when his parents Constantin and Annie left the Communist regime of Romania. When he was fifteen years old, Danield discovered card games. But he wasn’t focused on poker at this point. He was more of a jack of all trades, a hustler, playing pool games and betting on sports. He certainly got an exposure to the world of gambling, statistics and money management at a very young age. Unfortunately, he dropped out of high school. The “Unfortunately” part is debatable of course. Because this allowed him to trade in school work for big money pots at the local casino. Yes, Daniel become a rounder in his mid teens. He slowly grinded a bankroll and one day decided to live his dream by playing on the Las Vegas strip. Unfortunately the first time he went to the strip Daniel Negranu went broke and was forced to return to his home country to rebuild a roll. With time and sheer perseverence, Daniel made it to where he is today. 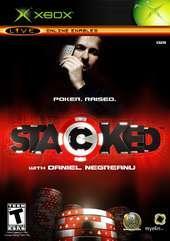 Stacked was the first Daniel Negreanu poker game of its kind, combining cutting edge graphics and next generation gameplay to recreate the experience of a table game. Utilizing 3D graphics and animations Stacked makes you feel as if you were in a casino, you really feel a part of the action . Stacked comes will all the bells and whistles that you can expect of course. One interesting aspect of the game is the “teacher” aspect. If you are new to the game, you will find all the instructions needed to play correctly. You can even face a robot that uses advanced artificial intelligence to make informed decisions. When we heard the name of the robot the first time we thought it was a Pokemon. Well you judge by yourself, but Stacked allows you to face Pokibot to develop your poker skills. What’s great is you receive real time guidance from Daniel Negreanu to fine tune your game. You can also face all the pro poker player that you love to watch on television. This involves household names such David Williams, Gus Hansen, Erick Lindgren, and Jennifer Harman . Being an Xbox game, you also have a career mode of course where you can track your progression to become one of the world’s best. All in all, Stacked was a great success and contributed to the extreme popularity that Daniel Negranu has had these last couple of years. (To view more discussion on this topic read here 2+2. This showcases the difference between life and online players. [“Both guys make a lot of money playing poker. A deal that would please them is likely much bigger than what is being offered to them at the moment. From a sites perspective, if you are going to sign a player you have to figure out a way for the deal to make sense from a financial perspective, in that, if you sign player X for $250,000 a year, will that player create that much value for the site by bringing in new players? Signing an online player has limited value. The reason for that, is that an online players fan base likely ALREADY has an account and already plays at the site. When a site considers signing a player they must gauge that players mass appeal on television and to the casual watcher. Being a big name in online poker, or even a player who’s gotten some TV time but hasn’t found his niche audience, isn’t going to demand big bucks from a site. Both players have potential to make a big splash on television and in live tournaments. Since that hasn’t happened yet, it would make more sense for them to wait until their stock price rises rather than selling at a low point. Pokervt is the most advanced online poker training site that you will find. Negranu has spent months working on it and the end result is an awesome learning experience. 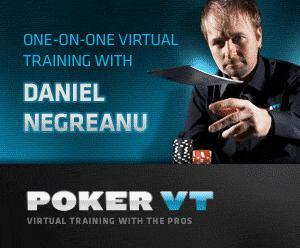 PokerVt explains the Daniel Negreanu small ball poker style which has been one of the cornerstones of his tournament success. Do you often go all in on the flop and end up broke ? Well you may want to look into Danny’s strategy. Danny Negreanu doesn’t like committing a lot of chips when the stacks are deep and you should do the same. Anyways, back to his training site. PokerVt has a number of modules that focus on different areas of the game. Usually the lessons are delivered as 1 on 1 videos were Daniel Negranu where he takes you by the hand and gives you step by step explanation of his though processes. There are a number of other exciting features such as poker pros playing together and recording their thought processes into microphones as the action progresses. When the hands are over Daniel Negranu goes through the action again, listens to the thought processes and comments on the hand. Certainly a very unique and exciting way to learn the art of poker. Other poker pros that are part of the pokervt team are Annette_15 Oberstad, pro online player Adam Junglen and world series of poker main event runner up Paul Wasicka. All deliver great content in the form of actual gameplay (cash and tournaments) recorded using Camtasia software. Negranu’s power holdem strategy received some mixed reviews. 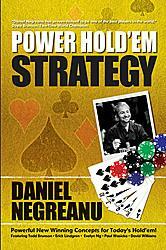 Personally we think this is a great little book to add to your poker arsenal. The first thing you should know is that there are a number of guest authors before Danny Negreanu chimes in. There are a total of 5 chapters written by the following poker pros: Evelyn Ng, Todd Brunson, Erick Lindgren, Paul Wasicka, & David Williams. Out of all of these, Evelyn Ng’s is one of the best because it presents an atypical way for beginers to become winners. It certainly is refreshing to find out about new viewpoints and strategies. Evelyn Ng seldom writes strategy articles and we thought her segment was excellent. The value of the four following chapters is more debatable. Although they are household names, the authors provide content that may appear rehashed to intermediate and advanced player. We believe these chapters will appeal to beginners however and they certainly aren’t bad. We were just expecting the book to delve into more in depth poker strategy. Brunson et all mainly write about basic poker concepts. So how good is Daniel Negranau’s contribution. Well, the best of the bunch by a landslide. We recommend that people read the book because of his section alone. * Play a lot of pots in position deepstacked. * Represent a wide hand range and bluff at some cards that would hit this range on the turn and river. If we had to give a grade to Negreanu’s Power Holdem Strategy , we would give a four out of five stars. All in all, we though the book was close to excellent and we would certainly recommend it. Daniel Negreanu Wife or Girlfriend ? 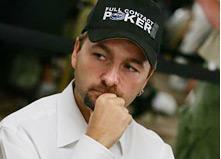 A lot of people wonder if Daniel Negreanu is married, whether he has a girlfriend or awife. In fact none of these are right. In August 2005 he married Lori Lin Weber. But they divorced in November 2007. So for the time being Daniel is single. We think you’re a little curious though. This video showing a Daniel Negreanu blow up has become viral on internet. We must tell you that it is fake of course and that Danny was playing an act. We don’t want to taint his reputation in any way. The first time we saw it though, we though it was real ! Great job Danny ! Good acting – and very funny too ! We really think that Daniel Negranu is more than a rising star in the poker world, he is an embassador to the game. On top of this, Kid Poker has become an iconic figure in poker history. 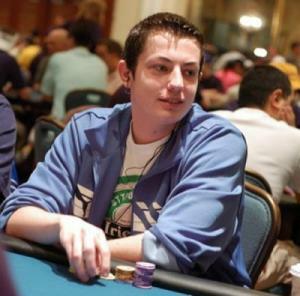 His name is associated with those of Doyle Brunson, Phil Ivey and Stu Ungar. Daniel Negranu is the poster boy for the modern wave of poker. He has also become one of the driving forces behind online poker with his involvment with pokerstars and training site pokervt. There is no doubt that in 100 years time people will still be talking about Daniel Negranu. This entry was posted on Saturday, November 8th, 2008 at 6:53 am	and is filed under California Poker. You can follow any responses to this entry through the RSS 2.0 feed. You can leave a response, or trackback from your own site.